Recently, I discovered that one of our Big Ten Rivals, the Iowa Hawkeyes, has their away football locker room painted completely pink. Intrigued by this, I wanted to deeper research to discover how the color of the environment around you affects how your mood or energy level reacts. 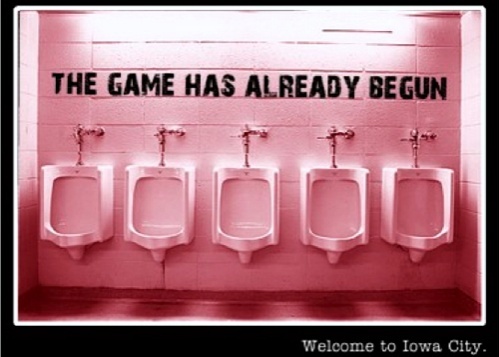 Iowa first painted their locker room pink in 1979. Since then, it has been an icon for Iowa football. According to empower-yourself-with-color-phycology.com, the color pink represents compassion, nurturing, and love. When an athlete is trying to get pumped up for a football game, being compassionate, nurturing, and loving is the last thing these athletes want to be. In a room, that is so overwhelmingly pink, it is hard to not let these phycological tricks get to you. If I were an athlete preparing for a game in this locker room, I couldn’t help to just laugh. The entire thing is so comical, but it actually works. Also, the color pink alleviates feelings of anger and resentment, two things every football player should have when playing another team. To find out whether or not Iowa’s win record was overwhelmingly better at home compared to away, I went through every season since the locker room was painted and counted the wins and losses when playing at home, and the wins and losses when playing away. Out of 452 games played since 1979, the Hawkeyes overall record is 274 wins and 178 losses. Of those wins and losses, 156 wins and 78 loss were at home. That leaves 118 wins and 100 losses were away. The Iowa Hawkeyes have a win percentage of 66.7% at home and a 54.1% win percentage while away. This is over a 10% win percentage difference from playing their football games in their home stadium versus playing their football game at an away stadium. Although the win percentage is so much better at home than away, there are other variables that need to be considered. It is a well known fact that teams always play better in front of their home crowds than away, so this could be a large factor that influences win percentage other than the pink locker room. According to Sports Algorithm Research, home college football teams win 59.97% of the time and away teams win 40.03%. Thus, Iowa’s win percentage is roughly 6% better at home than other division one college sports teams. Another variable that must be considered is the quality of talent of the Iowa Hawkeyes football players versus their opponents. If the quality of athletes is much better for the Hawkeyes, that will have a huge impact of who will win the game regardless of color of locker room or where the game is taking place. I also wrote a blog about this in the last blog period! It’s very interesting how little things such as paint color could change moods, ideas, and thinking. What I learned from my research is that pink is actually commonly used amongst juvenille detention centers. It is referred to as “passive pink” and is painted among the walls where uncontrollable children have to be restrained. The “passive pink” walls aer supposed to help calm the children and has been seen as affective. Here are some of the effects of other colors on mood and health! It listed different companies that use the color pink as well as different phrases, songs, quotes, etc. They said that pink had a vibrant energy just like the color red and it is lighthearted as well. I enjoyed looking at what results you could find for your blog, because I always kind of wondered too but never took the liberty of digging to find out why. I am not surprised with the results, and also what the color of pink represents. I always heard that blue psychologically was associated with sadness or white tied to purity, but I was not too sure about pink. With that being said, I’m glad I read your article because now I know more about color and their meanings, but also that pink indicates qualities that good football players should have. Here’s a link on another interesting article on their locker room. THIS IS REALLY INTERESTING. When picturing a football locker room, all I can see is darker colors, bright lights, and players head-butting each other to get jacked up for the big game (because every game is the big game). Never in my life did I even fathom to think that a locker room could actually be pink. The whole reasoning behind it is very logical too, and although the reason the Iowa Hawkeyes team has better percentages of winning at home could be due to chance, let’s pretend it’s because their locker room is pink. Colors have been proven to have diverse affects on people, shown in this article (https://www.verywell.com/color-psychology-2795824). Do you think this can be applied to learning processes as well? For example, the color a classroom is painted, the color of a textbook, what a teacher wears on a regular basis?